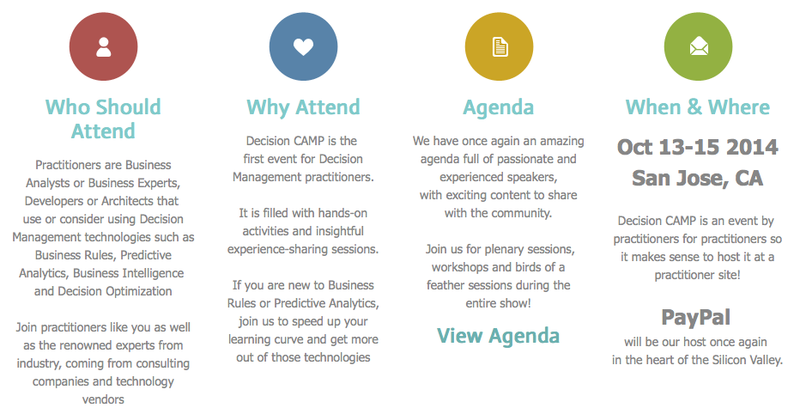 Only 3 days to go until Decision Camp 2014 arrives, a free conference in the San Jose area for business rules and decision management practictioners. The conference is multi-track with 3 concurrent tracks at same time. The Decision Camp full agenda can be found here. Like last year RuleML will be participating and presenting, such as Dr. Benjamin Grosof. Which is a great opportunity to catch up on the latest happenings in the rules standards industry. Last year I did a games talk, this year I'm doing something a little more technical, to reflect my current research. Here is my title and abstract.